Many Buick GS owners, including myself, have found themselves in the following situation. (Hopefully before the parts were painted and installed.) 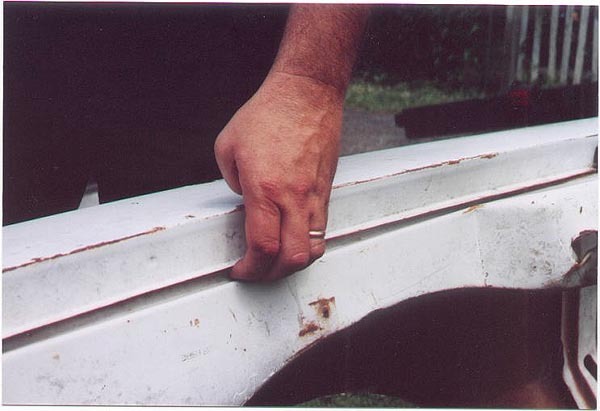 They spent the money to purchase NOS replacement Skylark fenders and discovered they were flat on top and needed to be repaired. The standard answer has been to sell the NOS fenders and use the money to buy good South West used fenders. With the availability of good used fenders now drying up that option is no longer open. This leaves us with two alternatives, either fix our original fenders (if possible), or fix the NOS replacement fenders. However, not all NOS fenders were made incorrectly. In the past I have seen many good ones. Its the last batches that were bad, and unfortunately those are the ones that seem to be left. Here is how the problem occurred. During final assembly the outer skin was installed too far down onto the inner fender brace and then spot welded, this makes the fender appear flat on the top. If you have a Bad fender it can still be saved. What you need to do is drill out the spot welds between the outer skin and the inner fender brace. Then you need to reposition the skin to the correct radius. You can use your hood or old fender as a reference. Then weld the pieces back together, grind the welds, and the fender is fixed. I know this is a lot of work, especially after paying for an NOS fender, but what alternatives we are left with.